Puerto Vallarta is a Mexican destination spread along the sparkling blue Bahía de Banderas. 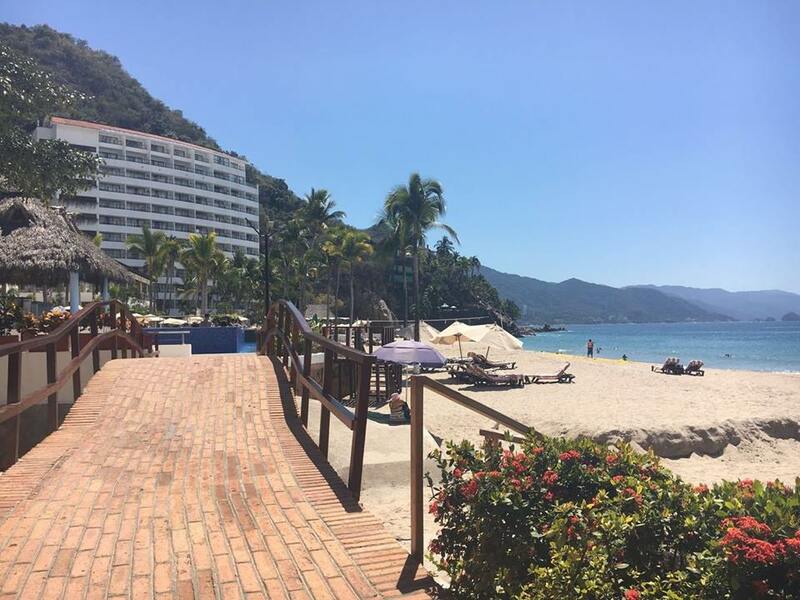 My favorite part about Puerto Vallarta is the unbelievably picturesque mountain and sea views dotted with beautiful boutique hotels and larger resorts. There are plenty of things to do here, including boating, horseback riding, diving, and walking along the malecón (boardwalk). After sunset, Puerto Vallarta rivals Playa del Carmen and San Jose del Cabo with their nightlife scene. Our list of the best resorts offers options for every budget. Check them out below! 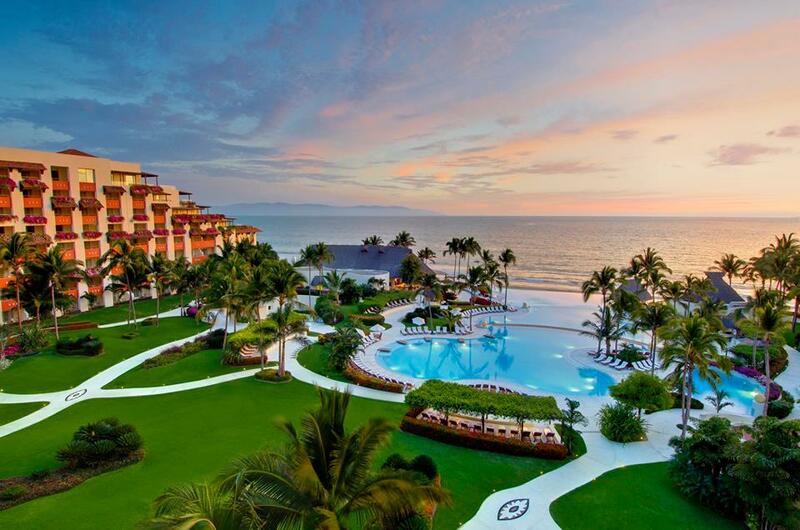 You don’t have to break the bank in order to enjoy a luxurious, all-inclusive vacation in Puerto Vallarta. Barcelo Puerto Vallarta is one of our favorite resorts for those looking to save a little bit of money, but not skimp on amenities. It sits on Mismaloya beach in south Puerto Vallarta, surrounded by stunning mountain vistas on one side, and the Pacific Ocean on the other. It is on the smaller side, with 316 suites, but they still have several restaurants with a wide range of cuisines. Fiesta Americana Puerto Vallarta (pictured above) is another relatively inexpensive all-inclusive resort. Here you will find stunning contemporary Mexican architecture and traditional Mexican decor. The building complements the surrounding Western Sierra Madre Mountains. Lastly, Riu Palace Pacifico is another great option. If you want to escape from the bustle of the city center, this resort offers the very best to meet your needs. Here you can experience 24 hour room service, several buffet and theme restaurants, a free gym, and a luxurious spa. Dreams Villamagna Nuevo Vallarta is a slightly more expensive option compared to the first three resorts. This all-suite, AAA Four Diamond Resorts is family-friendly, but also great for couples and romance. The oceanfront property boasts a gorgeous beach on Banderas Bay, views of the Sierra Madre Mountains, and more. 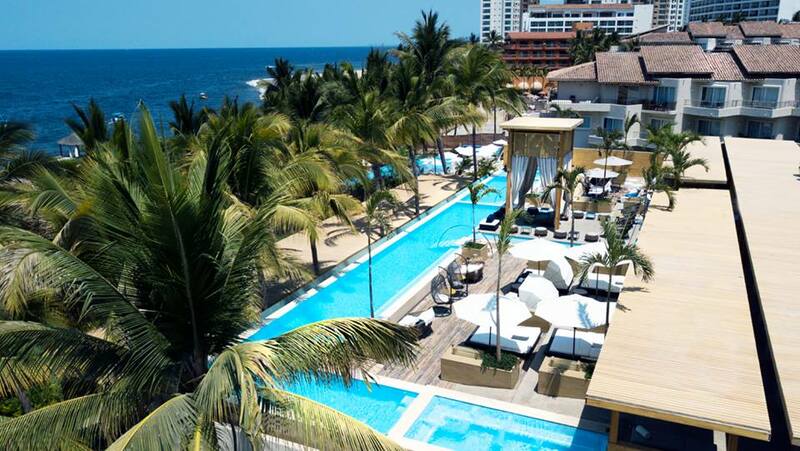 Another great mid-level option in Puerto Vallarta is Hyatt Ziva (pictured above). This property is also family and kid-friendly, but great for couples also. This resort sits on a private beach called Las Estacas. Here you will find eleven unique restaurants, bars and lounges, plus the lobby is a great spot for whale watching. Lastly, Secrets Vallarta Bay is a great mid-range option. This stunning property is within walking distance of the famous El Malecon boardwalk. Plus, enjoy full access to next door Now Amber Puerto Vallarta resort, which means more restaurants, more pools, and more beach! However, if you want to splurge, check out the two below options! For those wanting to go all out, we suggest one of two luxury all-inclusive properties which are located just north of Puerto Vallarta proper, in Riviera Nayarit. Marival Residences Riviera Nayarit is a great option. Here you will find spacious residences, gourmet a la carte international dining, and unlimited golf. Finally, Grand Velas Riviera Nayarit (picturedabove) is another luxury property in this same area. Here you can experience the only all-inclusive property in the Mexican Pacific that has received Five Diamonds by AAA. Call us today and ask to speak to one of our Mexico specialists at 402-281-3022!